The holidays (and CES) are over and the many of Google's app teams are back in the full swing of releasing updates. Gboard's latest version hit this morning few directly visible changes outside of minor wording and color changes. However, there are some interesting things that can be gleaned from wandering through a teardown of the apk. 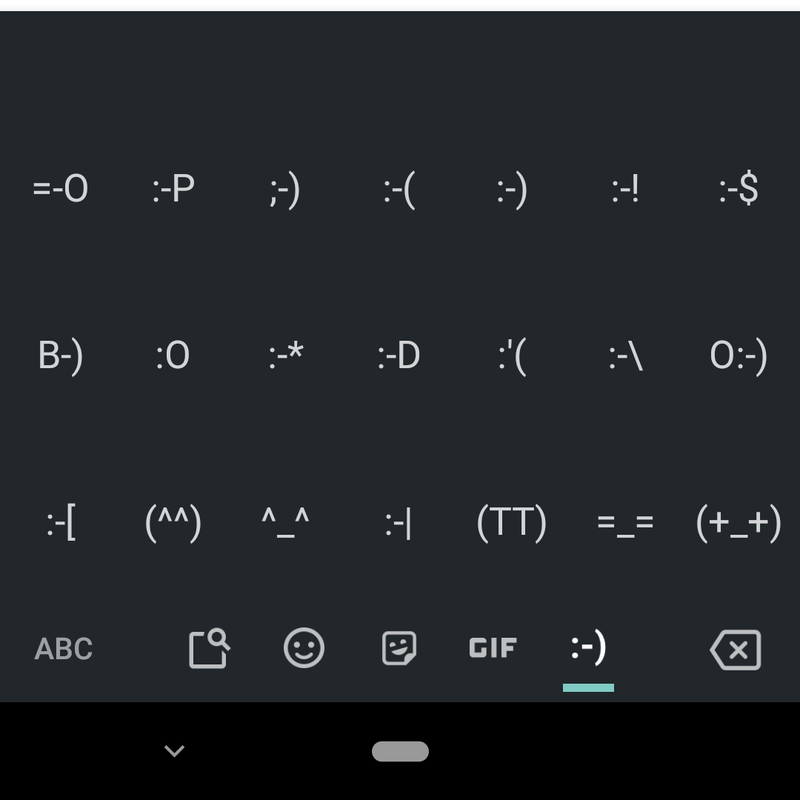 A new and much larger batch of emoticons is coming to Gboard. Titles for fourteen different categories were added (plus one for "Recents"), some containing as few as two emoticons and another coming in with twenty-four. You'll find a lot of the same common themes found in emoji, like various emotions and expressions, animals, and utility emoticons like pointers. Emoticons, unlike emoji, are made up of a few symbols from various languages that form a picture, much like the classic Shruggie. When these are enabled, the categories will appear in the symbol keyboard. New categories will appear here. 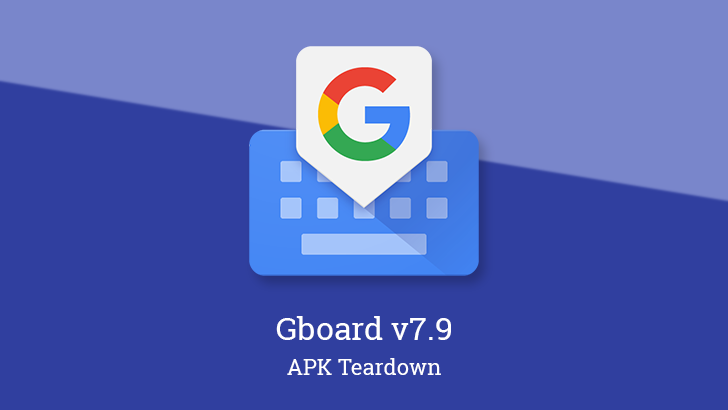 Many of Google's apps have a constant string of small experiments running in various stages, and Gboard is possibly one of the most active examples. Some of these experiments are controlled by flags managed deep within the app's code while others are more casually listed in plain text. I skip most of these, but this version did have a few interesting hints at some of the things that are being tested or may be enabled in the future. I'll keep these short since each one is based on just a single name for context. 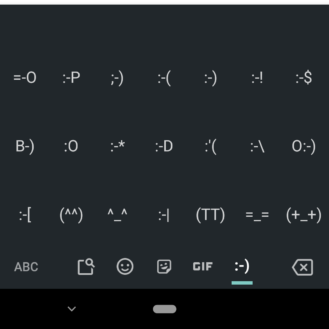 Gboard may be building some integration with Whatsapp to display the IM platform's own stickers, or maybe this is just for sending Gboard's own stickers to Whatsapp using the more efficient WEBP format. I don't know enough about Whatsapp's sticker situation, so I'm just kinda guessing here. It appears the Make A GIF feature may be testing output in MP4, probably so videos can be smaller and look better than they would in a standard animated GIF. It seems there's some consideration over the order of emoji versus other media in the universal search. Even though the flag says emoji aren't first, they currently are positioned at the beginning. Perhaps that will be changing? It's not terribly exciting, but there's also a switch to determine if some or all notifications should be shown in color. Evidently, the answer is Yes, but perhaps that may change in the future.